Enter Project Hospital. 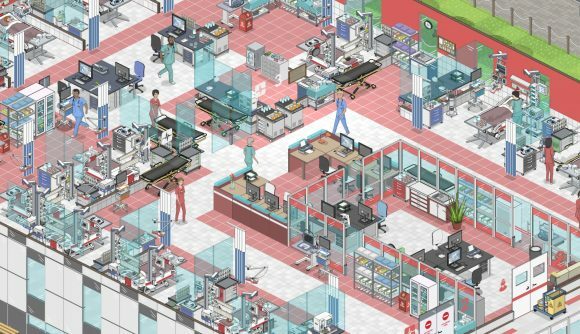 It’s a game that’s immediately recognizable as a Theme Hospital/Two Point Hospital clone, but it’s taking out some of the sillier bits and adding a certain, well, depth to the hospital management scene. There isn’t a lot of information out on Project Hospital yet, but just leafing through the screenshots I’m impressed with how it’s making a go at looking a lot like a real modern hospital. Lately I’ve visited a couple different real-world hospitals to see loved ones and family, and they’re complicated places: halls seem to shoot off at weird angles, lights and buzzers are going off all around, and inscrutable scientific monitoring equipment seems to cover most surfaces. Project Hospital seems to capture this hectic environment well – not only are you setting up examination and operating rooms, you’re creating in-patient areas for intensive care and recovery, you’re setting up workspaces for the many kinds of people who make a hospital function. In one of Project Hospital’s major departures from Theme/Two Point Hospital, you’ll also be building multiple floors and designing the exterior look of the hospital. That in itself is enough to pique my interest: it was a revelation when I figured out how to actually dig down into subterranean levels in Dwarf Fortress, so I expect having the ability to build vertically will similarly change up the hospital sim. Project Hospital launches Tuesday, October 30, and you find more information about it on Steam. While I’m still a big fan of Bullfrog’s old goofy spirit, I’m excited to try playing something that’s more ER than Scrubs.